BUTWAL, Feb 26: Folk rock band Nepathya performed at the Kalika School ground in Butwal on Saturday. The concert started in the evening lasted for two hours. The show started with their new song ‘Kuroop Anuhar’ and Nepathya sang their classic ‘Bhedako Oon’ treated with the special effect of snowfall for the concert goers. After singing their classic hits ‘Chekyo Cheko’ and ‘Aganai bhari’, the band performed their latest release, Sirfula. “I am glad to be in Butwal performing at the premises of this school and that too during this hour of the day,” said Nepathya's lead Amrit Gurung. “We had performed at this ground in 2003 during the day, as it was unthinkable to do a show after dark during those times. Being able to perform a show at this hour is a sign of peace being reinstated. I appeal to all people and parties not to take back this luxury from us,” he said. 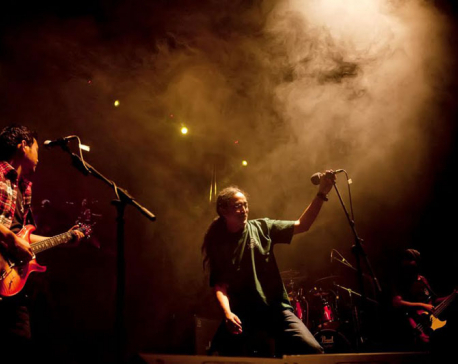 Nepathya had performed during multiple occasions in Butwal in the past. Most of it was during conflict and transition times, when shows were only ‘possible’ to be organized under daylight due to security concerns. “If someone asks, what do I do, I prefer to answer, I am a traveler and I also sing. I have had an opportunity to travel around Nepal and also around the world. Hence from my experience, what I can say for sure is we live in this land blessed by nature. Let us enjoy this and let us keep it intact for our future generation,” shared Amrit. “The place where you are living today (Butwal) was a transit point of our salt trade route. Traders from the mountains travelled to the plains to sell salt and would buy essentials for their loved ones,” said Amrit and sang his hits "Yanimaya Batauliko Bazarai ma yanimaya." 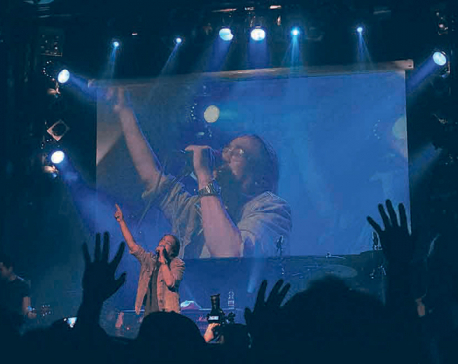 As the show proceeded with their all time hits like 'Chari Maryo', 'Jomsome Bazaar' to their new songs, 'Koshiko pani', 'Hami Nepali', 'Resham' and 'Taalko Pani' the crowd went frenzy with any song the band performed and anything Amrit said. Amrit then concluded the show with Ratora Chandra Surya, with the entire crowd joining him in applause. The show produced by nepathya’s management company, nepa~laya, with the theme ‘Music for Unity’ was organized by Butwal based Yes Nepal. As per Santosh Tandon of the organizing team, Abhiyan Nepal Child Home will benefit from the show. 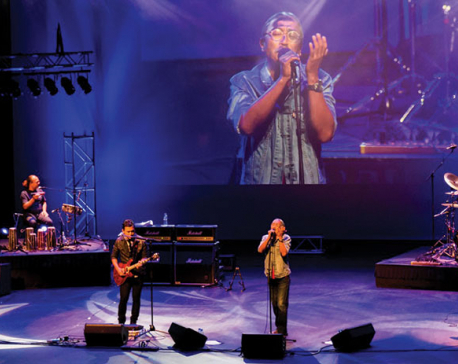 Amrit was accompanied by Dhurba Lama on drums, Suraj Thapa on keyboards, Subin Shakya on bass, Neeraj Gurung on Guitars and Shanti Rayamajhi on madal.